When I visited Singapore the first time and saw Marina Bay, I was blown away with its stupendous, futuristic style. Being the financial center for Southeast Asia, it has the absolutely dazzling night view and the bizarre-looking (another way to say "futuristic"?) skyscrapers. Yet it gets a bit tedious after some time as things could start looking artificial and out of place. Is sci-fi kind of scene doomed to be perceived as cold and "inhuman"? After visiting Gardens by the Bay, I was convinced that it doesn't have to be. Nature and imagination can co-exist to create truly extraordinary landscape. The outdoor landmarks, Skyway and Supertree Grove, are unquestionably stunning. (One should not miss the mesmerizing light and sound show at night at Supertree Grove! I would come back again and again for that.) 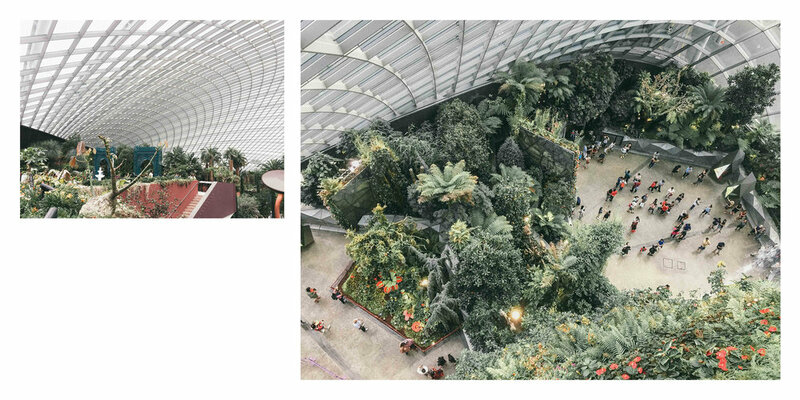 But what truly touch me are the botanic conservatories, Flower Dome and Cloud Forest -- by far my favorite place in Singapore. Spectacular and innovative, it is the largest glass greenhouse in the world as listed in the 2015 Guinness World Records! Be amazed by changing display of flowers and plants from the Mediterranean and semi-arid regions. Replicating the cool and dry Mediterranean climate, Flower Dome showcases exotic plants from five continents which are displayed in nine different Gardens. Wander amongst thousand-year-old olive trees and unusual Baobabs as you take in sights of the Flower Field Display. Yes the Baobabs with funny-looking bellies are rare to find in a conservatory. You may find many other interesting plants and flowers beautifully arranged by the floriculturist, such as miniature forests created with small size plants. The Flower Dome is beyond just educational and visually pleasing, but quite entertaining and innovative as well. I want all these succulents! Explore the tropical highlands amidst orchids, pitcher plants and ferns from the cool-moist Tropical Montane region. Be amazed as you encounter the world's tallest indoor waterfall at 35 meters and descend through the surreal mist-filled Cloud Walk and Treetop Walk. This is a truly spectacular architecture piece that provides lots of fun "walking in the air" and exploring the flowers clinging to the vertical vegetation. The occasional mist spray from the "mountain" turned the dome into a unreal, romantic space from the future. Cloud Forest is indeed an unique botanic garden that you probably won't find anywhere else.